This crochet flower was inspired by a pinterest find. I often find myself browsing through pinterest looking at stitches and just looking at pieces in general to find some inspiration. I came across this PIN which had a flower like pattern of stitches. As soon as I saw it, I thought it would be really nice to have the flowers on a headband. I really like the crochet flower stitch idea but there is no pattern listed for it so I spent a few days trying different things. After many failed attempts I finally came up with this beautiful crochet flower bud pattern. When I worked this up I was working in rounds, but it could be worked in rows, it is worked from bottom upwards. It would make a beautiful edging on an afghan or even a little girls spring-summer dress. The possibilities are endless! First pattern using these beautiful flower buds is a crochet headband. black, guacamole and rose blush. This pattern is worked in multiples of 3, each flower bud = 3 stitches wide. There is now a complete video tutorial of how to work up this headband available HERE. Crochet Flower Bud Headband Pattern..
Ch 60, making sure not to twist work, join with sl st.
Rnd 3: rep rnd 2, when joining with sl st draw up green coloured yarn. Rnd 8: rep rnd 7. Rnd 9: rep rnd 7, do not join, fasten off, invisible join. Below is my first attempt at making a chart. This is just to show the placement of the stitches to be used as a guide. This pattern is free to view, a PDF of the pattern can be purchased in my Ravelry shop..
Have you used these crochet flower buds? Please share your pictures on my Facebook WALL or hook up your project on Ravelry. Love this. I can’t wait to make it! Very nice! Love seeing someone else crochet with Susan Bates hooks and doing it the “knife holder” way! Very good explanations, look forward to making this. A little touch of spring. I believe they are redheart hooks. 😛 Glad you like the flowers. I’m in love with them, can’t wait to make more things with them. For the adult head band you start with 60 chains. Each flower bud = 3 sts. These are wonderful. I’ll get started on a couple for my “pretend” grand daughters tonight. May we have permission to sell them with your name as designer, of course? Yes people can make and sell their own items. I ask that people give credit to me for the design but it’s not necessary. Thank you so much for sharing this with us! Very cute! Thank you! 😀 I’ve already got a few projects on the go with this flower pattern, they are so fun to work up. This is the cutest headband I have ever seen. Cant wait to try it…. Maybe this pattern ->HERE<- would work for stand up bunny ears.. This is so cute! My daughter is getting married this summer and I think this would be fun to make for her daughters who will be in the wedding. Is it based on a multiple of 4? No, it’s worked in multiples of 3, each flower bud = 3 stitches. Hi, I’m having a problem: I can’t make 69 sc out of 60 ch sts in rd 2.. I originally had started out with 69 chain but that didn’t work very well, just forgot to fix that, it’s been updated now. Sorry about that. PS: Is there a computer program that you use to create the crochet diagrams? 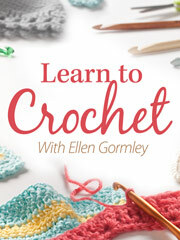 Just beautiful; you are truely a crochet artist. Now I think I will, with your permission, tweek your pattern so it will fit my 4 year old granddaughter. She has brown Shirley Temple curls and her middle name is Rose so I can’t wait to get started. I was wondering if you could give an estimate as I was trying to make this headband in a toddler size 2t-4T. Also, is it better to try and make this headband in a row pattern as opposed to a round pattern. thanks so much. Can’t wait to get started. It’s best to work in the rnd as the pattern does not account for turning or edging. To make a smaller size start chaining in multiples of 3 and check to see how your chain fits around the child’s head, once it fits not too tight or loose then sl st to join and continue on to the next rnd. If you don’t have the child’s head to check with, have the child’s head measured, again chaining in multiples of 3, lay your chain up to a ruler and have it about 1 inch less then the actual measurement and it should stretch to the desired measurement or just a little more. Thanks for sharing, I loved it! I am more into thread crochet but this design is so pretty I can’t resist doing it. Could this be transferred to using #10 cotton crochet thread Debi? I would love to know and the number of stitches used to get the same pretty results. Many thanks again. I’ve never worked with #10 crochet thread before. Maybe you could try chaining in multiples of 3 until it wraps around the head comfortably then follow the rest of the pattern. Thanks for replying! I will certainly try it out that way, I am a duffer at any kind of math, it is called dyscalculia, unfortunately. I was intrigued by your mention of the crochet designing software and went to tht site, called and spoke to Brian, I am very into filet crochet and have umpteen ideas in my mind but alas, they do not have a grid up yet in which to design the filet signs unless you import a grid and I confess to being technically challenged too! So perforce I shall have to be patient. I will let you know how my cotton headband works out, and thanks again. Will be trying this today! So cute! I LOVE these. What else do you thnk you could do with them?????? I am working on a dress right at the moment and I also have a blanket chart pattern I worked up that needs testing. Wow, this is lovely! Great job! I love that you even included two videos and a chart! Nice work! Thanks for sharing at Hookin On Hump Day! Hi Debi, I just wanted to thank you for such a great tutorial! 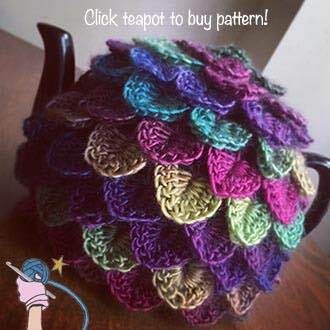 This is by far one of the cuter patterns I have come across. Your videos were great! Thanks again for sharing it with us! I love this idea for a headband – sometimes intermediate status is good for me, sometimes not but I do take the challenge and will make this for my daughter. Thank you so much for sharing. Even thought this is an intermediate pattern I think with the help of the two videos I made it shouldn’t be too hard. I made this tonight. Im a beginner and didnt have much problems since there are videos for what could have been confusing parts. I do have a question. Just out of curiosity why is the black band wider on one side than the starting side? This headband is 3″ wide when done? I love it tho and I learned 2 new stitches. Thx Deb…I like your tutorial. Hope to find more. Glad you were able to work it up, the headband is about 3″ but you could change that by adding some extra rows of black. This headband is perfect for our Skagit Valley Tulip Festival. I made your worked-in-the-round pattern but decided I wanted ties at each end so it will easily fit any head. I have made four so far, learning and improving each time. The last one I put an extra chain for each end and then anchored the top rows to the bottom extra chain with a dc into the side leaf and then another into the extra chain. It still looks awkward so I am onto effort number 5. Thanks for the inspiration! This would also make a gorgeous border on a simple babyghan! This is gorgeous , making one for my daughter , though I only have a very pale shade of green … thanks for sharing Debi do appreciate especially the video bit . Thank you so much for this gorgeous tutorial and pattern! I love crochet flowers of any kind! This is so versital and can be used in so many different ways! Thanks again! Deb, I love this design, but would love to make a large afghan. 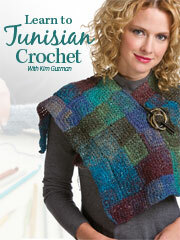 Can you help by letting me know what chain length to begin with for, let’s say, a 60″ x 80: afghan? Appreciate your help! I’m not to sure how this stitch would work up in rows, I’ve only ever worked it in the round. I’m guessing you’d need to have a dc stitch on each end of your work to work in rows. Each bud is 3 stitches and about an inch wide. SO lets say 58 rose buds x 3 stitches = 174 plus 2 for the stitches on each side (plus an extra 2 in your starting chain, that is presuming your first row is a row of dc) for a total of 178, working your first dc in the 4th ch from hook which will make the beg ch 3 your first dc. When working your rows always make sure that the green stem rows are worked on the wrong side of the work so that when you turn to work the buds they are worked on the right side of your work. 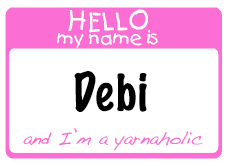 Ok, I’ll try that, Debi…thanks so much! Your efforts of working on this design has truly paid off. Super job! You can paste the url of this post into http://www.printfriendly.com to print off the image. Beautiful…. I need a program that takes diagrams and converts them to written patterns. How many chains do you think I would need to make a headband for a baby ? I have a written pattern for the chart to make a headband. Many thanks for this lovely pattern. Maybe you like to have a look on my Facebook profile to see what I made out of your pattern. I would be pleased! Have a nice weekend! Greetings from Bavaria, germany! Ooooo ….I really love your exquisite flower pattern against black. I think I would make this with navy blue instead of black. Thank You for your generous pattern sharing and skills. And all your dedication in getting “it right”. Can’t wait to see more things you create! YW, would love to see what you hook up.